Mr. Prof. Muhammad Yamin, SH (born in Sawahlunto, West Sumatra, August 24, 1903 - died in Jakarta, October 17, 1962) is an Indonesian national hero. He was buried in Talawi, Sawahlunto He is one of the pioneers of modern poetry in Indonesia, and also 'creator myth' primary to President Sukarno. He married Raden Maya Sundari Mertoatmadjo. One of her sons is known, namely Rahadijan Yamin. He died on October 17, 1962 in Jakarta. In colonial times, Yamin one of the few lucky people who can enjoy the secondary and higher education. Through that education, Yamin was absorbing foreign literature, Dutch literature in particular. The works written in Malay first in the journal Jong Sumatra, a Dutch-language journal, in 1920. His works are still tied to the early forms of Classical Malay language. In 1922, Yamin appeared for the first time as a poet with his poem, country; meaning "homeland" it is Sumatra. Homeland is a collection of modern poetry Malay first ever published. Sitti Nurbaya, the first modern novel in Malay also appeared in the same year, but was written by Marah Rusli also a Minangkabau. The works of Rush's popularity experienced a period of ten years. The set of the second Yamin, spill my blood, appears in the October 28, 1928. This work is very important in terms of history because at that time, Yamin and several nationalities fighters decided to honor one country, one nation, and one single Indonesian language. Drama, Ken Arok and Ken Dedes are based on the history of Java appears also in the same year. Between the end of the decade of the 1920s that in 1933, Roestam Effendi, Sanusi Pane, and Sutan Alisjahbana are pioneers main Malay-Indonesian and literary. 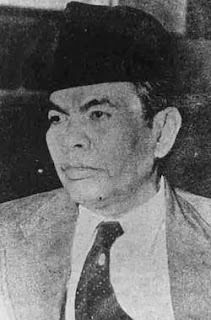 In 1932, Yamin gained diplomas in the field of law in Jakarta. He then worked in the field of law in Jakarta so 1942. His political career began and he was active in nationalist movements. In 1928, Congress set the Indonesian Youth II, which is derived from the Malay language, as the language of the Indonesian nationalist movement. Through pertubuhan Indonesia Muda, urged Indonesian Yamin used principle for a national language. By then, the Indonesian language is the official language as well as the main means of innovative literature. During the Japanese occupation between 1942 and 1945, Yamin duty at the People Power Center (PUTERA), a nationalist organization that is supported by the Japanese government. In 1945, he reserves that a Business Investigation Agency Preparation of Independence (BPUPK) diasaskan as well as the new state covering Sarawak, Sabah, Peninsular Malaya, Portuguese Timor, as well as everyone in the Dutch Indies. Sukarno who is also a member of the supporting BPUPK Yamin. Sukarno became the first president of the Republic of Indonesia in 1945, and Yamin was sworn to important positions in his administration. Yamin died and was interred in Talawi Jakarta, a city district located 20 kilometers from the capital Sawahlunto regency, West Sumatra.